Race challenges and series – but why?! Running is hard. Let’s just put that out there right away. But for most of us, we either love to hate it, hate to love it or for the REAL running maniacs – love to love it! Whether it’s the addiction to the runner’s high (thanks endorphins! ), the appeal of seeing our bodies change, the ability to clear your mind, the need to push yourself through a challenge, the desire to prove something to yourself, the draw of the many health benefits or all of the above – we keep doing it. We lace up, we head out, we run. Committing to a race is one of the best ways to stay motivated and encourages us to set goals. Maybe it’s a 5K you want to tackle or perhaps a half or even full marathon. No matter the distance, a race is a challenge in and of itself. It requires putting your body through painful training, remaining dedicated even during taxing conditions, feeling showered with nerves on race day and to top it off – paying money to go through all these things! So then why in the world would you ever go a step further and commit yourself to doing MORE than the norm of a simple race and sign up for additional distances or multiple races?! We asked our runners this very question and the responses were inspirational, to say the least. First let us break down the different challenges that In Motion offers. 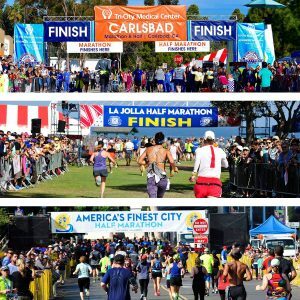 The three races included in the Triple Crown challenges below are the Tri-City Medical Center Carlsbad Full/Half & Surf Sun Run 5K (January), the La Jolla Half Marathon & Shores 5K (April) and the America’s Finest City (AFC) Half Marathon & 5K (August). Half Marathon Triple Crown: the original challenge, est. 2007. 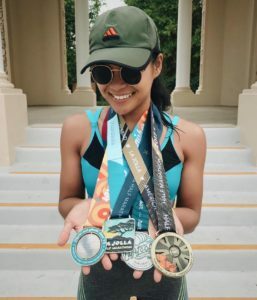 Complete the three half marathons in the same calendar year and receive an additional fourth champion’s medal at the third and final race. 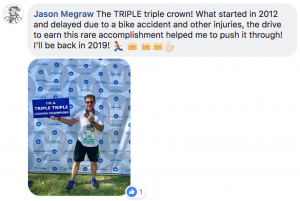 TRIPLE Triple Crown: a three year commitment! Complete three Triple Crowns in three consecutive years and receive ANOTHER champion’s medal at your ninth and final race (that’s 13 total medals!). SoCal 3×5: Complete the three 5Ks in the same calendar year and receive an additional fourth champion’s medal at the third and final race. Double Down Challenge (new for 2019! 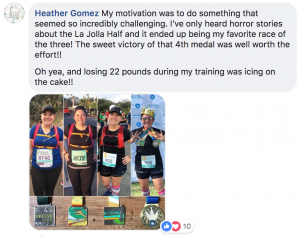 ): Run both the 5K followed by the half marathon at the Tri-City Medical Center Carlsbad Half Marathon and receive double bling, plus an additional challenger’s medal. Many of our Triple Crowners don’t necessarily start off the year or even the first race with the intention of completing a series challenge. But everything changes when you cross the finish line. You realize just what you are capable of and how strong you are and you may start to wonder – how much stronger can I get? Plus you have trained hard and put a lot of time and energy into preparing for that first race and you may not want to lose the amazing running shape that you are currently in. This is where the goal setting comes into play. The goal could include “go big or go home” and you register for the remaining two races right there and then. Or you just start slow and commit to running the second race and see how it goes. Either way, you have a goal of crossing another finish line, and you are still on your way to being crowned a champion. Many also crave a challenge, something that pushes you and keeps you going. The goal of completing a Triple Crown challenge series gives you a reason not to stop or get lazy. Eye on the prize – the shiny, shimmery Champion’s Medal prize. 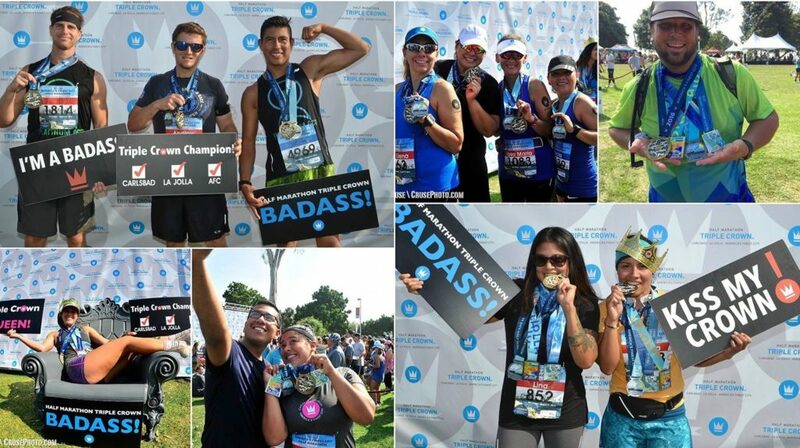 Whether you are checking off a bucket list item or get hooked to the idea of being a Champion after your first finish line at Carlsbad – it’s the GOAL of completing the challenge that makes you crazy enough to complete it. Running is healing, and completing challenging goals can be a fast track to feeling whole again. Finding yourself and living a healthy lifestyle are guaranteed side effects of the running journey. Often the need to prove something to yourself and/or others is the driving force behind wanting to complete a challenge. Sometimes we just need to show the world that “I can do this!”. Let’s be honest – we just need the medals! We are visual creatures and having something so sparkly on our wall that represents our hard work is all the reason we need! We believe many people can relate to this one and it’s such a beautiful reason, that we had to include it! 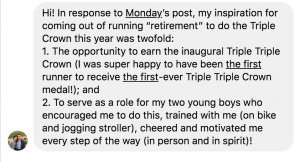 Those of you striving to be a good role model and a positive influencer through running by pushing yourself to do great things – we applaud you. 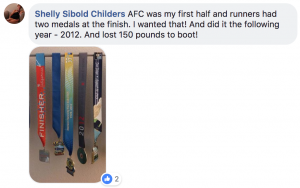 The idea of being bestowed with a champion’s medal and hearing your medals clinging together as you proudly walk away whilst knowing that you accomplished something that many covet and everyone admires is, well, enticing – admit it! But actually doing it and not just dreaming about it is something that takes determination and perseverance. We know it’s in you. 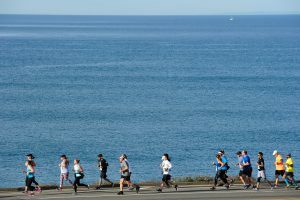 Carlsbad kicks off the 2019 Triple Crown challenges on January 20 – do you dare? !